The Huber KISS K6 is a cooling bath thermostat with an insulated cooling bath built for thermoregulation of objects directly in the thermostat bath. It is suitable for a number of typical heating and cooling tasks such as sample temperature control, materials testing, quality control, analyses, etc. Cooling bath thermostats with insulated cooling baths are an economic solution for thermoregulation of objects directly in the thermostat bath. 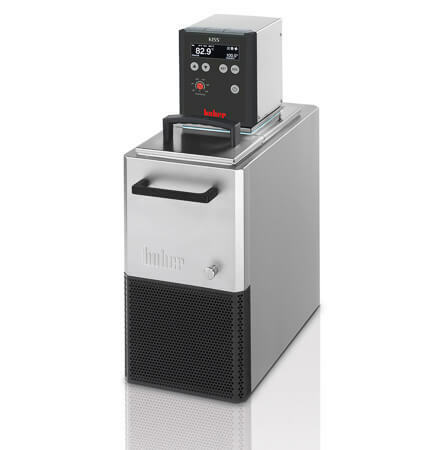 The units are therefore suitable for a number of typical heating and cooling tasks such as sample temperature control, materials testing, quality control, analyses, etc. Cooling circulator operates with natural refrigerants and are therefore offer an environmentally friendly solution to temperature control. In addition, cooling circulators are fitted with automatic refrigeration capacity adjustment, reducing energy consumption and waste heat down to the absolute essential. With low level protection and adjustable over heating protection the units fulfill the requirements of Safety Class III/FL according to DIN 12876. The thermostats can also be used for externally attached applications using the pump connections at the rear. The new KISS controller combines state-of-the-art technology with simple operation and stylish design. KISS models are suitable for routine tasks in research and industry and are convincing as practice oriented basic equipment.